So what was this election really about? So, now that we’ve had our week and a half, for the dust to settle, let’s figure out what has happened to our government and what it means. For those coming out of their cave, the Republicans took the house, and Democrats held the Senate (barely). So my initial reactions are: oh, why can’t everyplace else in the country be as the smart as the places I live. In South Bend we sent back Joe Donnelly despite the tough competition of his heavily funded Tea Party opponent. (Seriously, was anyone else sick of seeing her face before EVERY YouTube video and on the side of EVERY web page?) And back in my wonderful home state of Massachusetts, the hyped-up “Scott Brown effect” turned out to be nothing more than hype, as we stayed completely blue in all 10 districts in addition to electing a Democratic governor, treasurer (shout-out to Steve Grossman, because well my Mom was once his campaign manager), and auditor. It reminded me of this image depicting Nixon’s 1972 presidential win. There even more so than now we were the rock of blue in a sea of red. But, I digress. So let’s return to examining the state of the union. In MY opinion there were two real lessons in this election. Lesson one was the economy is first and foremost, and people want it to be the top priority. Let’s be honest, Obama was concerned with the economy, but was also taking care of bigger issues, like reforming Health Care. The lesson was NOT that Obamacare and big government are evil. The statement was really, “Do something that will actually have a noticeable positive effect in the mess that my jobless life has become.” People can’t truly hate something they don’t understand especially when a huge chunk of the changes haven’t even happened yet. And a huge portion of people who aren’t happy with the bill, wished it went further. The Republicans missed the message however, because they think we should waste valuable time trying to repeal Obamacare. Rather than fix the big issue that is affecting everyone’s lives, the Republicans want to continue to battle that is already over. Some people accept defeat gracefully and move on and focus on the greater picture. The Republican Party lacks a little bit of grace it seems. To me this whole thing seems truly remarkable. When you think about it, repealing Obamacare is fairly un-American. Oh yes, I went there. What do I mean, you ask? The backbone of America has been innovation and creativity. Politicians on both sides throw those words around all the time, but what does that really mean? Neither of these concepts involves being afraid of trying something new and different. There’s a reason the message of “change” energizes people. In America, we have seen that when people take risks and do new and different things, we move forward. Innovation is what made our country great. So why would we be too afraid to try a different type of health care? We all admit the current system is broken. And anyone who looks at the bill could tell you that most major changes are still on the way. Shouldn’t we give a legitimate idea a try BEFORE we spend all our energy trying to kill and stifle it? Revolution didn’t seem like a great idea at the time, but people ran with it and it worked. Let’s see where Health Care takes us, instead of wasting months and months trying (and most likely failing) to repeal it. Instead let’s maybe FOCUS ON THE ECONOMY, like voters want clearly want Congress to do. So now that rant part one is complete, I will draw back to emphasize the other big lesson of this election, when combined with the last election. People are sick of Washington. They are sick of both parties. They want something new and different. Obama campaigned on change. And the changes he accomplished (which were big) were just not seen. So the Tea Party came along and promised to change the establishment. Time will show that they aren’t planning to do that either. But the point is this, Americans want visible change. We’ve lost faith in both political parties. Obama was seen as an untouched guy; a fresh newcomer, untouched by the taint of long-standing corruption and allegiances. The Tea Party was a group of people outside the mainstream Republican Party. They may have all been batshit crazy, but they were a fresh group of faces. We want different so desperately that we buy into the new and fresh, and avoid the issues. 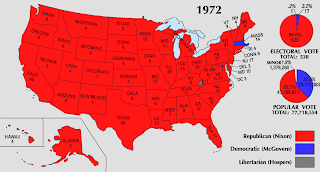 If we were voting on the issues there is no way that the wave that the same country that overwhelmingly voted Barrack Obama as President, would subsequently vote this Republican Party into power. On the matter of the issues, they agree on basically nothing. The only thing that's similar, is that both campaigned as being sick of Washington, and that's something Americans identify with right now. But here’s my thought. People weren’t that sick of Washington before we voted in President Bush and the Republicans. Under Clinton we were pretty happy with our government. But 8 years later, we were stuck with two wars we shouldn’t have been in, with a skyrocketing debt, a tax system that made life easier for the rich, while they were screwing us with a far too deregulated Wall Street, which eventually led to a financial collapse from which we still have not recovered, and a broken health care system that was skyrocketing in costs. There was a reason to be sick of Washington. But in two years, a lot of those things have begun to change. The problem is people don't want a beginning to change. They want fully formed and completed change. But seriously look at what we've done. We got out of one of those unnecessary wars, and while we still need to evacuate the other one, that’s a step in the right direction. But nobody seems to have noticed that we have NO combat troops in Iraq anymore. The debt is still skyrocketing, but the broken economy should take precedence over the debt. Drive the debt up, by fixing the economy, and when everyone is prosperous again, you will be gaining more money from taxes, and be spending less and the debt will reduce again. The idea of focusing on the deficit while the job issue looms is simply backwards. It’s the great Republican deception. Follow the left hand problems of debt to ignore the right hand successes on the job front. 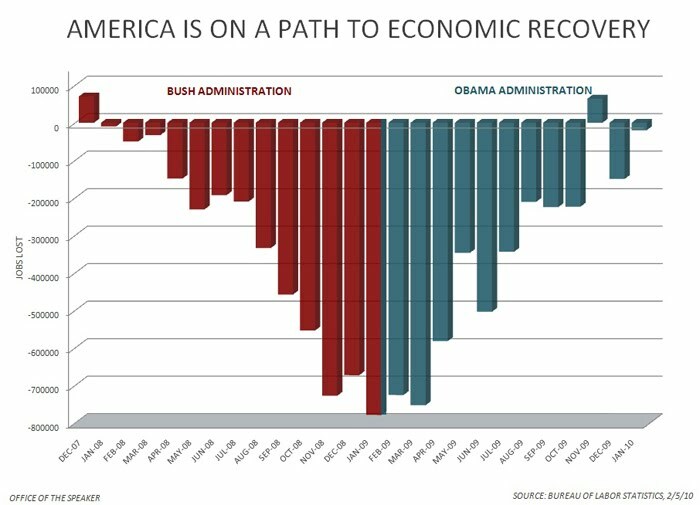 And yes, I realize Obama didn’t immediately stop job loss and therefore failed to fix the economy in the eyes of the American people. But in the end, he did stop the hemorrhaging, which was going at its strongest when Bush finished up (see chart below). Without a stimulus we would undoubtedly be in double digit unemployment. The deregulated Wall Street is on its way to being more regulated, with the passing of Financial Reform. Health Care is also on its way to being fixed. The impact of these two laws cannot be measured yet. It’s far too soon. That kind of change is long term. That’s what the American missed between 2008 and 2010. Obama promised change and he delivered. But people haven’t seen it yet. History will show the truth, but we don’t live in history. We live in a world of instantaneous gratification. The lesson of the election really is that true change will cost you. If the focus is always going to be on the next election, change doesn’t sell. Because no one trusts change until it’s over and it’s worked. People want change, but while in the actual process of change, people become scared. What they really is for change to have happened not to be happening. That means doing something worthwhile will mean losing an election or two. For those Democrats who lost their seats, because they voted for Cap and Trade or the Health Care bill, I commend you. Governing is not about winning the next election. Governing is about doing what’s right, and what’s good for the country. And history will show that Democrats did that. So while we sit through two years of gridlock, as the House prepares to shut down the government entirely, let’s remember and enjoy that we did something real and concrete, and that history won’t remember or like the people who sat on their asses while the country needed change. Today is a great day to be proud of our nation. It is a day of solemn homage, and also a day to be proud of and thankful for the freedoms we enjoy as American citizens. Whatever your opinions of the current and past actions and inactions of the American military, you still owe a certain measure of gratitude and especially respect to the men and women who give their lives defending our country. I know that at times we are disappointed in or even angry with the actions of individuals in our military. Sometimes this displeasure is entirely justifiable. The military is not without flaws, but every human institution has its flaws. The good of the U.S. military far outweighs the bad, and, until the wonderful time when there is no need for a standing army, our military will continue to defend the American people. I hope that at some point today everyone has a chance to reflect on the meaning of Veteran’s Day and the people who have given their lives throughout our nation’s history in order to preserve the ideals of the United States of America. I’m going to take the opportunity to reflect right now, and in doing so I’d also like to share a personal story. My family has been in every American war from the American Revolution (Ethan Allen) through Operation Desert Storm (Kevin Steele). This includes my grandfather, Theodore Myers, who served in Vietnam. The story I’d like to focus on is that of my great-grandmother’s younger brother (I don’t know the proper term for that relation), Otis Perkins. Otis was a senior engineering student at the University of Kansas when he left to volunteer for service during the build up to WWII. He entered the military before the U.S. entered into war. He enlisted first in the army and then in the U.S. Army Air Corps. In this capacity, he was stationed at Hickam Air Field in Hawaii and was there when it was attacked by the Japanese in 1941. He survived the attack and entered into service in the Pacific theater. He flew recon missions for Army artillery in a small unarmed plane. He was a very successful pilot and survived countless battles. April 29, 1945, during the Battle of Okinawa, Captain Otis Perkins was riding as an observer in a Marine Corps Plane. The plane was shot down in the course of the battle. Then a peculiarity of the military and its distinct branches took effect. Because the Marine Corps is a division of the Navy, the plane was under Navy jurisdiction, and it is the policy of the U.S. Navy that burial at sea is honorable. Thus, the Navy will not attempt to locate or recover the plane. 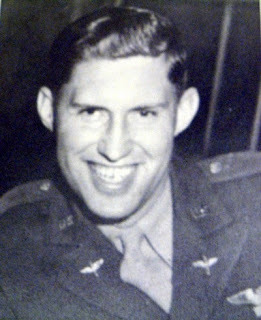 If Captain Perkins had been shot down while flying his own plane, the U. S. Army would have attempted to recover the plane and his body. Captain Perkins served in the U.S Army for 5 years, fighting in the pacific theatre from the very beginning, but was killed just 3 ½ months before the end of the war. I first heard this powerful story from my father, and it sparked my desire to serve my country, which I intend to do as a lawyer, politician, or in another government position. I don’t know what my future holds, but I do know that service to my country will somehow be a part of it. With this story and my sincere desire to honor Otis Perkins, I took an opportunity afforded me by the Presidential Classroom program and was selected for the honor of laying a wreath at the Tomb of the Unknown Soldier at the Arlington National Cemetery. That's me in the back left. I will never forget the experience. I was able to honor Captain Otis Perkins and all of the other veterans in my family. It was an amazing feeling to be able to honor them in this way. On each of the two Veteran’s Days (including today) since then I have been able to call to mind that experience and reflect on the veterans in my family, past and present. I was able to thank my Grandfather for his service earlier today; I urge you to take this day to remember how much we all owe to our veterans, and, if you can, take the time to thank any veterans you know. By now, a few of you might have seen me, shoving a pamphlet in your face this morning outside of DeBart, shouting about NTDs and promising you a free silly band. Sorry that we were so annoying, but this week is NTD Awareness Week, and it’s my mission to get everyone on campus interested in a bunch of diseases that no one really knows about. So here goes. NTD stands for Neglected Tropical Diseases, a series of seven disfiguring and potentially deadly parasitic illnesses that affect 1.4 billion people around the globe. That’s more than malaria and AIDS combined, a number that could fill the Notre Dame stadium 17,822 times. These diseases are a big deal. So why hasn’t anyone heard of them? Put simply, they lack the drama of malaria and the death sentence of AIDS. NTDs kill slowly and indirectly. When a person contracts an NTD they contract a lifetime of drawn out suffering, of chronic malnutrition, asthma, pneumonia, cancer, blindness and disability. Some NTDs cause itching so intense it drives people mad, drives them to suicide. 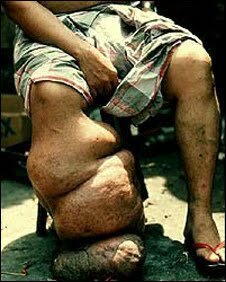 With others, such as Elephantiasis, tiny worms pool in the lymph nodes, swelling limbs and, in males, the scrotum, to impossible sizes. Some of the parasite burrow into lung tissue or the intestines, robbing victims of the breath and sustenance and leading, in the long term, to cancer and other equally horrific deaths. Sorry to gross you out, but here’s the kicker: all seven NTDs can be prevented, treated or cured for just 50 cents per person per year. It’s trite, but 50 cents really can save a life. The medications to treat these diseases have already been developed and donated by major medical suppliers. The cures are free; we just need to get the medicine where it needs to go. To me, that’s the grossest injustice. People desperately need the medication, and we don’t have the funds to get it to them. During NTD Awareness Week there will be various events around campus to raise money and simply inform people. There will be another silly bandz give-away tomorrow in front of DeBartolo, and on Wednesday, from 7:00 to 10:00 Five Guys will donate 10% of all proceeds to ND Fighting NTDs. Thursday, come to LaFortune and support us by buying a dirt cup (use your flex points!) and Friday ND Fighting NTDs is hosting a free concert and petition signing on South Quad in front of Dillon Hall from 4:00 to 6:30 pm. I know most of you are just as broke and stressed out as me, but small efforts can make such a huge difference in this campaign. Stop by LaFortune on your way to the library Thursday. Sign a petition for our politicians before dinner on Friday or visit our website (http://www.nd.edu/~ndfntds/) for more information. Our top priority is to inform people right now, even linking this post on your Facebook or Twitter is a huge help. To solve a problem we’ve got to know about the problem, so take the first step. Check out this video or these websites and help end the neglect. I found this a couple days ago. It's actually really well done.